Loosely based on a recipe that I got in a class from Judi Strauss, this recipe has been a hit at potlucks and family gatherings. It’s pretty easy to make, though if you cook the onions, that can take some time. It is best served warm, but you can bake it at home and reheat in the microwave, and it turns out well. I recently had a very successful dinner party of 7. The food was all Asian-inspired, mostly because I really wanted an excuse to make this recipe. Most of the food was from the freezer section of Trader Joe’s, but I made this and a few other items I may write about. 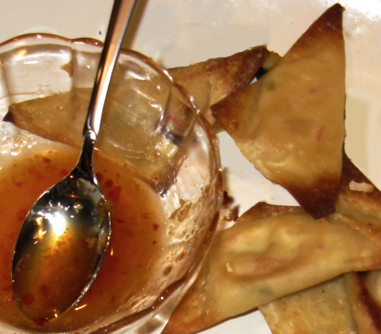 7 people ate all 48 crab rangoon in a fairly short period of time, which I found pretty impressive. Admittedly, I think my husband and I alone accounted for half of the 48, but that still leaves about 5 each for the rest, so I think it’s safe to say they were a hit! I took a class on hors d’oeuvres recently from Judi Strauss, a local chef. She has one-night classes held in the Beachwood Middle School Home Ec room, or at least those are the ones I take. They’ve all been about watching, learning, and eating – no doing involved. Quite low stress, and quite fun! At this last class, Judi gave us some party food advice. The most useful to me was the following, as I never know how much food to make! Judi made us five delicious hors d’oeuvres. I’ve made two, the spinach puffs and the island meatballs with sweet and sour sauce. I made a version of the latter recently for a New Year’s Eve party. They came out quite well, and seemed pretty popular, so I thought I’d write about them.